Stragglers lost the toss and fielded first, the decision we would have made had we won. The pitch was tricky and offered unusually variable bounce for Ascott Park. Assad Naeem and Mark Hunt opened the bowling and worked hard and tested the batsmen regularly, backed up by some good fielding. Forcing a quick single one of their openers was forced to retire with a hamstring strain. By now fully warmed up and loose Assad was beating the bat with great regularity. However it was Mark that got the breakthrough forcing a wild shot from their opener that landed safely in the bucket hands of Matt Shales at first slip. The Stragglers continued to exert pressure and scoring was not easy. Adi (guest player from the Nomads) & Tony Hooper backed up the efforts of the openers and the wickets continued to fall. Lunch came with the game well balanced but the Stragglers feeling they had probably edged the morning session. After an excellent lunch the Stragglers continued to work well in the field and kept the run rate under control, not allowing the batting side to settle in to a rhythm. 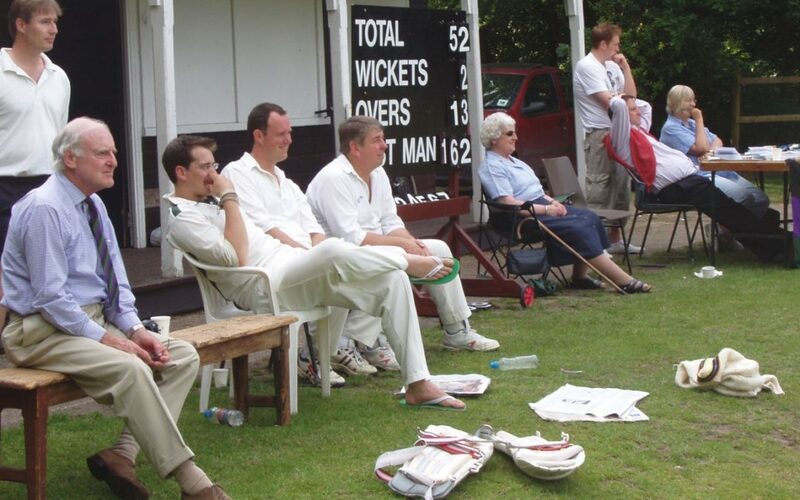 The Nomads eventually declared at 193 for the loss of 7 wickets. The highlight in the field being the great catch from Matt Shales in the deep, making good ground and grabbing a tough chance to remove a batsman that was starting to do some damage. Overall the team stuck to their task and put in a solid fielding effort on what was a very warm and sunny day. The declaration left us with quite a few less overs to chase down the runs. With an early wicket (Nomads guest Rupert Style) falling, James Allsop joined Will Russell and they batted through to tea although free scoring remained tricky as it had been all day. It remained tough to score and their opening bowler in particular gave very little away. Wickets the started to fall and the run rate began to creep up, at 5.30pm when the final twenty overs began we needed 130 runs to win with 6 wickets in hand. On a better pitch this would have looked more achievable but as the overs ticked by the rate climbed, a couple of wickets fell and it was now decision time. Conor came out swinging and had some success but it became evident that their total was not going to be possible to reach, Will Russell having worked hard and got to 42 fell (by running himself out) and was followed by a couple more quick wickets. Conor hit a brisk 40 but was bowled trying an expansive shot possibly not suited to the state of the game… This left the Stragglers 8 down with 14 balls remaining, a nerve jangling finish was in store. Mark was bowled by a very good delivery leaving Nino to stride to the middle. One wicket needed, 8 deliveries left. Nino is fast developing a reputation as ‘the Wall’ and survived, Assad at the other end looked rock solid in seeing out the final over. The draw was secured, a fair result. It would have felt rough to have lost a game in which we had played pretty well for the most part. A major improvement on last year and we look forward to getting a Win next year. Thank you to the Nomads for helping us find two great chaps to play for us.